It was just one thing after another, after another, after another…When was it ever going to end? How was it going to end!? Wenona Taylor never had an easy life, but she was a hard worker. With a CDL license, she drove trucks for many years, but with the birth of her twin sons five years ago, and with no one to help her take care of them, being on the road was not an option. Wenona was able to find other jobs and keep a roof over their heads and food on the table. She subsequently moved out of the city to Wrightsville. Then about a year ago, life started spiraling out of control. First, Wenona lost her job and then her car broke down. After receiving her income tax return, Wenona was finally able to fix her car. But the money didn’t last long with rent and gas for job hunting. When she ran out of gas money it was even harder looking for a job. Next there was the fire. Someone carelessly flicked a cigarette in front of her apartment which started a smoldering fire. Fortunately, Wenona and her children got out safely and there wasn’t much damage. Through the fire she learned the building was not up to code and had no exits except in the front. Wenona then took some bad advice, when a lawyer said not to pay the rent until the apartment was brought up to code. Not paying the rent resulted in being evicted. 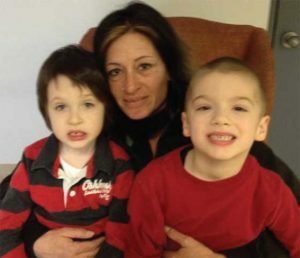 In April, she found herself and her sons homeless. After a short stay at Bell Shelter, and a three month stay in her mother’s basement, Wenona became desperate. She was afraid if she couldn’t find a place, Children and Youth would take her boys, her very reason to go on. After losing the apartment and with no place to study, Wenona gave up trying to get her GED and had to drop out of York County School of Technology. Between the constant moves and spending time looking for a place to sleep and eat; there was even less time to look for a job. Finally, in September, Wenona and her sons came to stay at the York Rescue Mission’s Women and Children Shelter. With a safe place to stay and warm food, she felt there was a future. She has been able to get a construction flagger position and while they are often not working because of the weather; it is a job and it is helping. Just when things seemed to be getting better, Wenona’s father was brutally attacked. After being in a coma for several days, he was moved to a nursing home. Previously, her father had been looking for a large enough apartment where Wenona and her two sons could live with him. Now the tables were turned. Instead of her father taking care of Wenona, she applied for guardianship of her father. Wenona is now taking responsibility of her father who will not be able to work again due to the attack. She is thankful she can stay at the Shelter where she doesn’t have to worry about her family’s safety, how she is going to feed her children, or even worse, if they will be taken from her. She is starting to dream again. She is hoping to get a reliable job which pays enough in order for her to get an apartment – a home for her family; her sons, her father and herself. Maybe one that even has a back yard.